Red Wheel ∕ Weiser Online Bookstore | Grimoire of Aleister Crowley: Group Magick Rituals by Rodney Orpheus, Aleister Crowley, and John Dee et al. Group ritual has been a cornerstone of spiritual practice since time immemorial, yet its history and importance have often been overlooked by occultists of the modern age. This book is the first comprehensive presentation of group-oriented rites for modern magicians inspired by the works of Aleister Crowley. 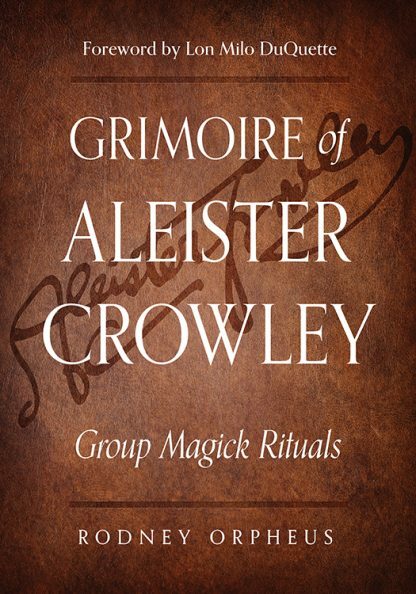 It contains rituals written by Crowley for his own magic circles, many of them unpublished during his lifetime, plus rare ancient texts that were Crowley�s own inspiration. The rituals are newly edited and explained by Rodney Orpheus, who brings to this volume decades of experience in performing and teaching Aleister Crowley�s rituals within Crowley�s magical order Ordo Templi Orientis. He introduces each ritual with a clear overview, setting each in its historical context and explaining its function and mode of operation, and includes detailed notes on the setting and performance of each one. Whether absolute beginner or seasoned expert, magicians of all paths will find this volume to be an eminently workable and extremely powerful grimoire spanning centuries from ancient Mithraic and Bacchanalian rites, Goetia, and Gnosticism, right up to present day Crowleyan invocations and sexual magick.